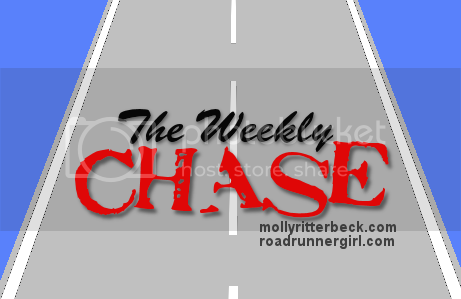 Road Runner Girl: The Weekly Chase #152! What a great weekend!!! It started out on Friday with some Starbucks with my prince! Then we drove to a nearby town with my friend Kirstin and her family to meet Andy's family. We went to the town's Christmas tree lighting! The tree was huge! It kind of reminded me a little of a Dr. Seuss tree because it was curvy. The boys loved it! And we got lots of great pictures! After the lighting we went to Mellow Mushroom for some pizza! Yum!!! The next morning I ran 7 miles with Jenny! I'll tell you all about my run on Wednesday! At lunch the family and I ate at our favorite sandwich place. Then we went for a walk at our favorite hiking area to enjoy the gorgeous weather! We started introducing the boys to the original Star Wars movies on Thanksgiving break. So last night we finished it up with the Return of the Jedi! We are trying to get them ready for the new movie coming out soon! And yes...Cullen totally approves of our Star Wars watching! Especially because that meant we were sitting on the couch for a few hours...and he could get all comfy and take a nap lol! Sunday morning, after my run, I had a interview with a local running organization. They wanted to interview me about my running. Pretty cool! Then I met the family at church. We had a busy afternoon. Sawyer had gymnastics and Hayden had a cub scouts meeting. Goal #3: Maintain my weight by logging my calories. Yes! It's getting hard to resist all those Christmas goodies that are everywhere!!! Goal #5: Run at least 1 run under 2 miles. Yes! I ran most of my runs this week as under 2 milers. I knew I ran a ton on Thanksgiving break and my body needed a little streaker "rest" time. Goal #6: Complete my December school calendar for parents. Yes! Goal #7: Plan a Christmas gift from my class to their parents. Yes! I'm going to do ornaments again this year! Goal #6: Book a hotel for Sawyer's gymnastics meet this weekend. Sawyer has his first meet of the season this weekend. I need to book a hotel room for the night before since he competes the next morning. Goal #7: Buy goodies for the team for after the meet. It's my turn to give the boys goodies for after their meet. Knowing how much boys love to eat, I'm planning on getting them a bunch of snacks for the ride home! I did that last season and it was a hit! That's my plan this week! I hope you have a great week accomplishing your goals!